Nothing describes the absurdity of this winter better than this quote from today’s New York Times: “Snow starts around noon, as temperatures hover just above freezing, and roughs up the evening commute. At 6:46 p.m., spring begins, the snow stops abruptly and twittering robins drape the city with garlands of daffodils.” Steve and I laughed heartily when we read this and then we stopped laughing and each shed a single tear for the loss of our meteorological innocence. What can I say? Prolonged and brutal winters can make you a little crazy. So, just give up on the weather and simply eat and drink to your heart’s delight. To help you with that, here’s an easy recipe for an appetizer that you can make with things you can find right now in your grocery store. 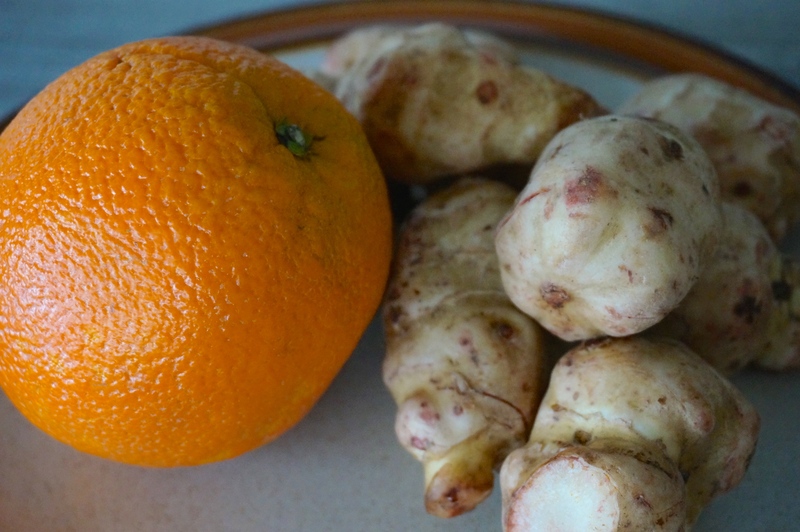 Sunchokes are also known as Jerusalem artichokes, for reasons that I can’t fathom, since they are closer to potatoes and carrots than artichokes. In any case, they crisp up in the oven really nicely and they pair very well with toasted pine nuts, orange, and rosemary. A hint of balsamic vinegar adds an additional note of acidity and the final dash of aleppo pepper gives it that unexpected smoky heat that draws you in for one more bite. 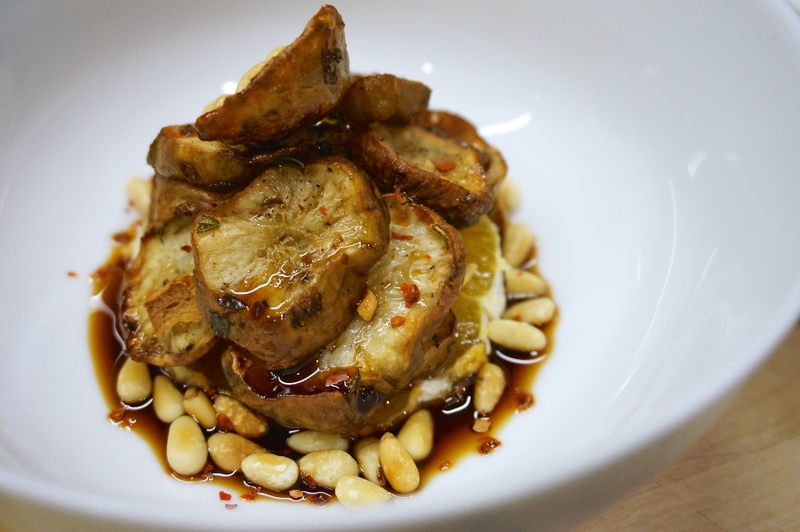 In a sauté pan, toast the pine nuts over medium heat, tossing frequently, until they give off a toasted smell and they just start to turn golden brown. Immediately remove into a plate and allow to cool. Slice sunchokes crosswise into 1/4″-1/2″ slices. In a large bowl, toss sunchoke slices with the garlic, rosemary, olive oil, and some salt and pepper. Spread on two large baking sheets, so that all sunchoke slices are lying flat on the pan. Make sure that all garlic slices are on top of sunchoke slices, otherwise they will burn. Roast in the preheated oven for about 30 minutes, without turning, until the bottoms of the slices turn dark brown, but don’t burn. The tops will stay yellow and become soft. Meanwhile, peel orange and slice crosswise in four 1/2″ slices (there will be some orange left over). Place each slice in the bottom of an individual serving bowl.